You only get one chance to capture that perfect wedding photo. Actually, that’s not strictly true. The average wedding photographer (though who in their right mind wants just an AVERAGE wedding photographer?) will take thousands of photos spanning your entire wedding day, but don’t let that fool you into thinking that, whatever happens, you’ll at least have some decent photos. If you want those perfect wedding photos, you’re going to have to do some leg work. The first part, obviously, involves finding a wedding photographer who knows how his camera thingy works. So, you’ve got a wedding photographer whose photos make your face light up. 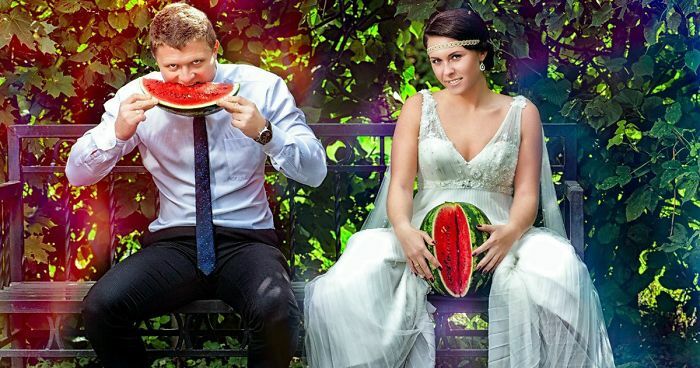 You want perfect wedding photos, don’t you? In which case, you’re going to have to do some work with your wedding photographer. You have to tell them what you want, why you want it and get their input on your ideas. Wedding photographers know what they’re doing. They’ve done it before, so ask their advice. Listen to what they say. If they suggest that holding a watermelon at groin level is a bad idea, listen to them! 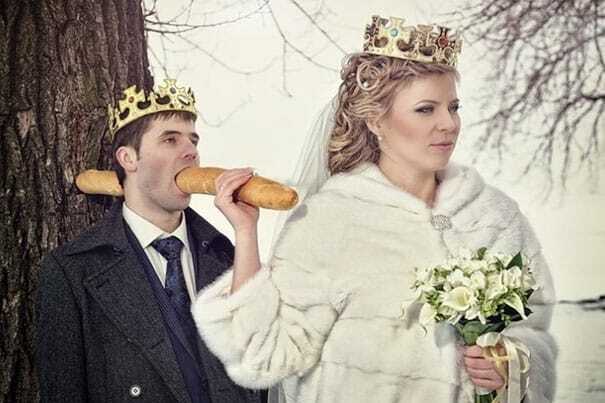 I warned you about searching for bad wedding photos, didn’t I? Good question. Thankfully, the lovely folks at Your Perfect Wedding Photographer have created a handy infographic to give you some ideas. Asking a few of these questions will give you the peace of mind you need for your wedding photos. It’s important to know when you’re going to get the photos ahead of time as every wedding photographer works differently. Some photographers are quite happy to send you some images via email fairly quickly – as a sweetener to keep you happy, while other wedding photographers prefer to keep you in suspense and wait for the entire album to be ready. The most important thing is to make sure you’re on the same page with your photographer so that you know when you can expect to receive your wedding photos, as you’ll probably need to buy 1,253 boxes of tissues. You may want to ask this in a less double entendre-ish manner. You need to be absolutely certain you know which parts of your day the photographer is going to cover. Be very clear about when she is going to arrive and when she is going to leave. Most wedding photographers have a clear start and end point, such as “I’ll leave after the first dance”. This is far more helpful than having a wedding photographer say, “I’ll be at the evening do, for ‘a bit’…”. Be absolutely clear about what parts of the day the wedding photographer is going to be there for. I know that this sounds like the kind of question you’d ask a hitman, just to make sure that your mother in law is eliminated, but it isn’t. It CAN be, but it isn’t usually. Wedding photographers often have a second shooter – someone helping them, taking photos from different angles, editing on the fly, reloading memory cards etc. Logic would tell you that the price of having two photographers would be exactly double the price of having one, logic would be wrong. The second shooter is often a less experienced wedding photographer, who can still take fabulous photos, working under the main photographer. Because they are less experienced, they are often much cheaper to tag onto the wedding photography package, so you might as well ask. 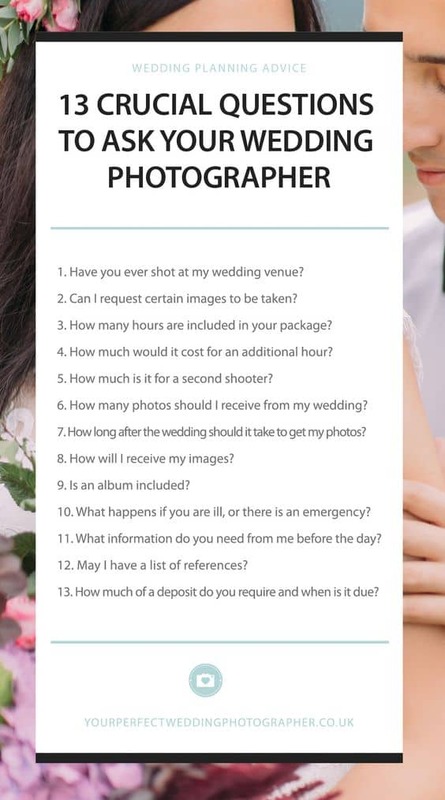 Can you think of any other questions you would like to ask a wedding photographer that aren’t mentioned in the infographic? If so, please post them below in the comments. Feel free to like, detest, share, steal, borrow, copy and mock this post (I think that covers everything you can do on social media). Also, if you know of anyone who you think would find it useful, please pass it along to them. You might also want to send them in the general direction of a free book I wrote, about how to deal with the most stressful parts of the wedding day. If you’re looking for some wedding entertainment that will get your guests laughing and having a fabulous time on YOUR wedding day, I can help. 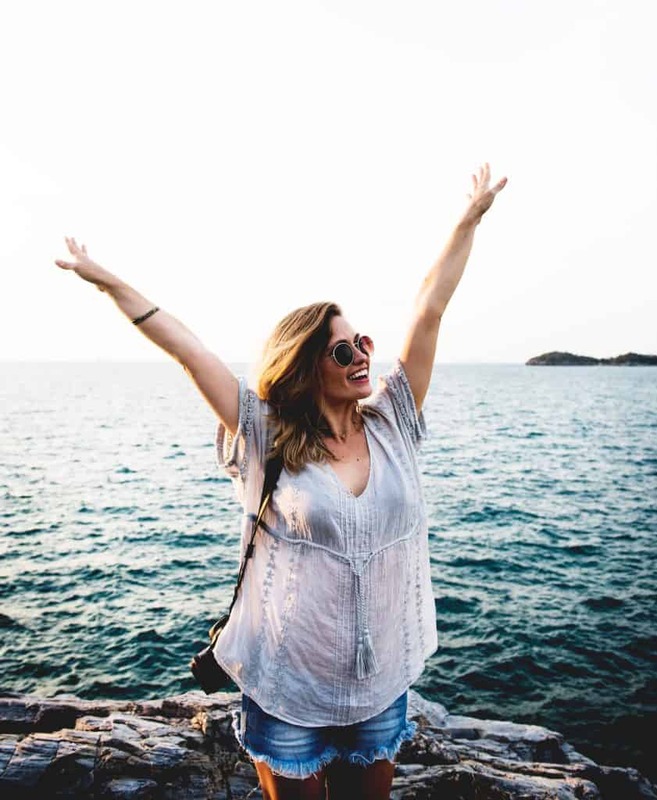 Tell me all about your wedding day below and I’ll tell you how I can make it amazing for your guests and stress-free for you!